US, 1954, 87 minutes, Colour. Burt Lancaster, Jean Peters, John Mc Intire, Charles Buchinsky (Bronson), John Dehner. 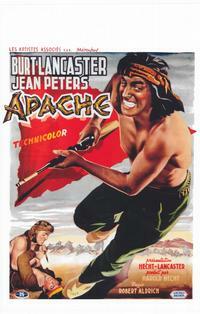 Apache is one of the earliest films of director, Robert Aldrich. He had developed, over the decades, a reputation for making tough films. Apache is in this vein, a sympathetic presentation of Massai and his relationship to Geronimo. Burt Lancaster, in his young athletic days, seems at home in the central role. He is well supported by Jean Peters and Charles Bronson in one of his early films. It is also one of the first films that showed a great sympathy for the plight of the Indians last century. Robert Aldrich was to go on to make such films as Whatever Happened to Baby Jane, (1973), and Twilight's Last Gleaming (1977). 1. Was this an enjoyable Western? What conventions of the western did it use? Fights, sieges? White and Indian hostilities? 2. How interesting a picture of the Indians and humanitarian interest was this? As made in the 50's? Attitudes now? 3. How well did it explore the race theme? Audience presuppositions and sympathies about American Indians, the picture of justice, a just picture, realism, optimism? 4. What was audience response to Indians and Indian history and their place in the United States? As conquered by the whites, as victims? 5. How was this symbolised in the fate of Geronimo at the end of the war? What had happened to the Indian? The humiliation of the train ride and the white treatment? The taking of photos and the vaunting of the white people and the humiliation? What was being said about the fate of the Indians in the character of Santos? As a chief, as collaborating with the whites? His drinking, the young men working on the roads under the white tyranny? 6. How tyrannous were the whites in the film? Whittle and his attitudes? Driving the Indians, the soldiers? The Indian fighter and his relentless seeking of a war? What comment on white attitudes did this make? 7. How interesting a character was Massai? As portrayed by Burt Lancaster? A warrior and his final shooting, a proud Apache, suffering humiliation in capture and the train ride? The exhilaration of his escape, the important sequence of his walking in St. Louis and the impact of white civilisation? What did he learn during his escape? His encounter with the Cherokees? The nature of his return, the bitterness when he was betrayed? His fighting and cruelty? His cruelty to Nalinle? His love for her, settling, growing corn, the influence of the child? How had this changed him? His final walk and throwing away the gun? What future? What message for the future? What message for the future of the Indians? How did he stand for the Indians in times of change? 8. Indian dignity? The importance of the Cherokee sequence and the discussion of the changing into white man's ways with dignity? was this convincing? As an ideal and dream for the Apache? As put into practice by Massai? 9. How attractive a character was Nalinle? Her support of Massai in the revolt, her handing him the knife, her continued devotion to him, her loving him, following him, her suffering but yet her persuasion, her influence on him to settle down, her child? The dignity of Indian women in this character? 10. How important was Sieber, the Indian fighter? As summing up many American attitudes towards the Indians? Eager for the final fight? The siege in the cornfield? Why did he give up and allow Massai to live? 11. What comment was being made on the Indian supporters of the white men, the trappers and their skill, Hondo and his alliance, the irony that Hondo was in love with Nalinle? Did this add to the authenticity of the film? 12. The importance of the final fight? Massai's vigour and desire to win against all odds? His being surrounded in the cornfield? The final encounter and his throwing away his gun? 13. Was the happy ending satisfactory and satisfying? Was the message well conveyed? What difference did it make that American actors took the part of Indians? Did this detract from its impact? Did it make it acceptable to wider audiences?